WE WILL BE HAPPY TO WELCOME YOU DURING THE CURRENT 2014 SUMMER SEASON !!!!! 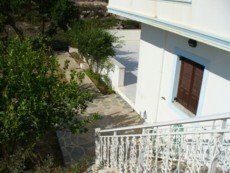 We offer two types of rooms on two levels. Air conditioning is currently available in select rooms. 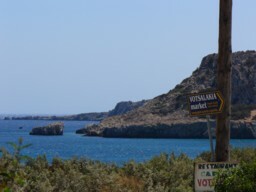 Please contact us by phone at 011 30 698 0667731 or by email at greeknut@aol.com for information on our latest rates and room availability for the 2014 summer season. Please see our rate information at the page entitled: "Contact Us for Room Rates". Rates will vary based on length of stay, when you stay, and choice of room type. Welcome to our rooms on the lower section. 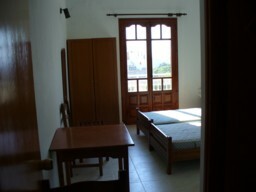 On the courtyard level, we offer several smaller rooms with small windows only around the door. These windows can be opened onto the courtyard during the day or evening to take advantage of the natural breezes to cool your room and relax your body and mind. 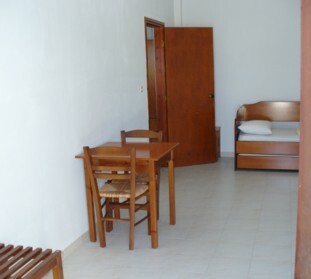 We have also a "family unit" or "group unit" that consists of two connected room areas that can be used by a family or a larger group. This section has an extra bed. On the upper or street level, we offer several rooms that are a bit larger and that have regular french style windows that open like doors onto individual balconies. 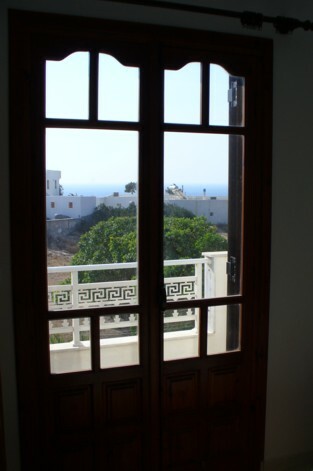 From the balconies you will have a fantastic view of the Aegean Sea and the island's natural beauty and you will also be able to avail yourself of the cooling and calming natural breezes. 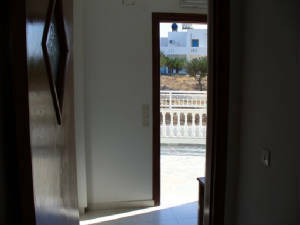 Looking out to the road from the upper entry hall. 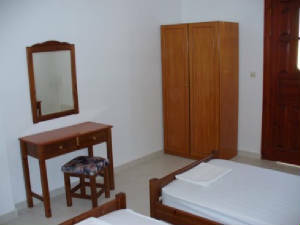 Each room has two beds, small wardrobe closet or wardrobe table, mirror, chairs, complete kitchenette facilities, and personal bathroom facilities. 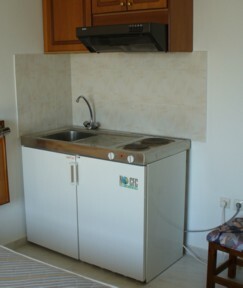 You are provided with eating utensils as well as cups, plates and bowls in your kitchenette. 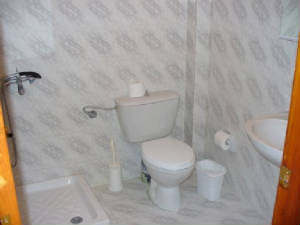 Your bathroom has shower, sink, mirror/cabinet and toilet. 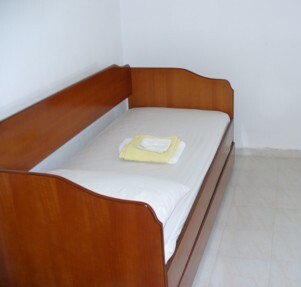 And sheets, pillows, pillowcases and towels are also provided for you. Looking down the hall from the upper entry way. 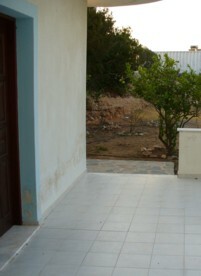 On the lower level, you can walk on our tiled courtyard and take in the wonderful views of the Aegean Sea. If you choose an upper level room, take advantage of our balconies to sit and enjoy an evening of conversation or watching the stars come out over our wonderful island! Looking toward the french doors and beyond is the balcony. 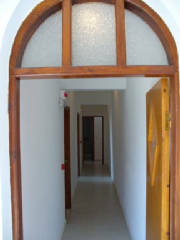 Just a short walk from the main road to our lower level rooms. One of our fine courtyard level rooms. Cook Your Own Meals or Snacks If You Wish ! A sample of one of our kitchenettes. 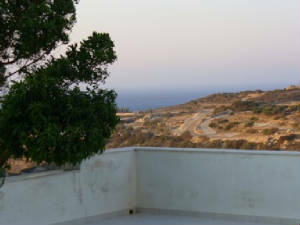 Looking out to the Aegean Sea from our courtyard. These waters are perfect for swimming ! Walk on our cool tile floors. With shower, toilet, sink and cabinet.